Editors' note: Matt Dacy, director of Mayo Clinic Heritage Hall and a longtime friend of In the Loop, joins us today as a guest editor/columnist/storyteller. Nancy Reagan liked to say she had a "magical friendship" with Mayo Clinic, since it was a future surgeon's sleight-of-hand that introduced her to the institution. 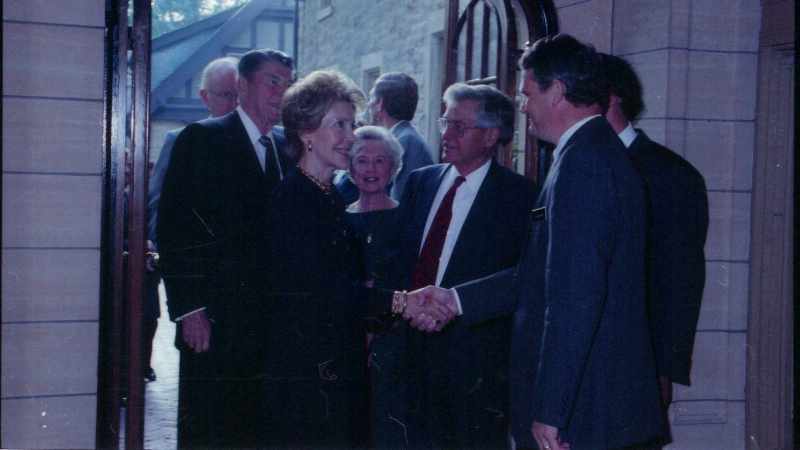 Mrs. Reagan, who died March 6, was a loyal Mayo patient and advocate along with her husband, former President Ronald Reagan, for more than 30 years. But her initial ties to Mayo Clinic went back much further. In 1940, a young student named Oliver Beahrs was working his way through Northwestern University Medical School. He earned money for tuition by performing magic tricks. The faculty adviser for the school talent show that year was Loyal Davis, M.D., a prominent neurosurgeon, whose wife, Edith, was an actress. During rehearsals at the Davis home, Ollie Beahrs met his hosts' teenage daughter, Nancy. They stayed in contact, even as their lives took separate paths. He became a distinguished surgeon at Mayo Clinic. She moved to Hollywood and supported her husband in his transition from acting to politics. When the Reagans needed medical attention, it was natural for them to reach out to their friend at Mayo Clinic. Read the rest of Mrs. Reagan's story. Mayo Clinic Minute: How Much Water Should You Drink?